FreeStyleGames is happy to work on DJ Hero for now, but it doesn't want to do music games forever. 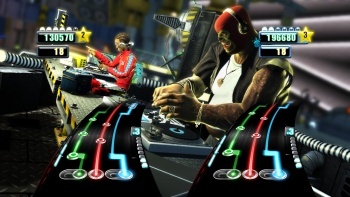 Later this year, developer FreeStyleGames will release DJ Hero 2, a hip-hop/techno/electronica/dance/whatever music game. As the number on the end might indicate, this is the sequel to last year's DJ Hero, which was also a hip-hop/techno/electronica/dance/whatever music game from FreeStyleGames. With the slow-burning success of the DJ Hero series, clearly, FreeStyleGames has found its niche in which to thrive, right? Not so much, creative director Jamie Jackson told CVG. The developer made other types of games before DJ Hero, and it wants to make other types of games after DJ Hero, too. "As a developer I've worked on Colin McRae Rally, I cut my teeth on driving games," said Jackson. "We went on and made rhythm action games around break-dancing, it was almost like a combination between Street Fighter and a rhythm action game." The studio had also been in the middle of developing a sports title when it had joined up with Activision to make DJ Hero, he said. "Yes, DJ Hero is our idea, our baby, it's in our blood and we really care about it. As a developer though we're diverse," said Jackson. "[We] can do a lot of different things and I'd hate to say we're going to do this forever because I don't think we will." At the moment, finishing work on DJ Hero 2 was the studio's focus, said Jackson. But after that? Who knows? "[We don't know] what is going to happen next year, but it's exciting and at the same time I definitely want to do other things in the future." Best of luck, guys. Better hope you've earned one of those new IPs ol' B.K. was talking about.